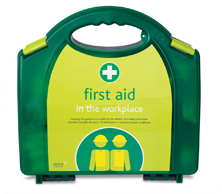 Durable polypropylene box with black safety clips, integrated carry handle, and a secure airtight lid provides protection from dust and water. All contents meet the Health & Safety Executive guidelines. Available in 10, 20 or 50 person size depending on your number of employees.